The Patiala turban was evolved over a period of time and is best suited for those with broad faces and sharp features, ethnic characteristics which exemplify Sikhs of the region. Since its inception, however, cross migration of Sikhs within Punjab and across the diaspora has somewhat affected the style, with the true Patiala Shahi turban connoisseurs now being relatively small in number. Even though the Patiala turban has developed into an art form, it captures a carefree spirit, mainly because the larhs (layers) on both sides are not worn in a neat or distinguished manner. Overall, it presents a round look with its rear being flat. The thumb is used to depress the cloth at the forehead to create the perfect, triangular effect with the fifty (a band of cloth worn under the turban, the colour usually chosen to match). Patiala The Patiala turban Other requisites of the Patiala turban include use of Finlay�s "F-74 mal-mal" fabric, at least seven-and-a-half meters of it, which is cut in half and sewn together to double the width; some light starch; and, a twist in the last larh. Additional Deputy Commissioner, R.S. Randhawa, explains that the final larh was twisted in order to strengthen it so that it could support the kalgi (aigrette). The tradition, long after the kalgi has been discarded as an ornament, has however continued, says Mr. Randhawa. He adds that the tradition of leaving the ear lobe visible in the Patiala style is continued by those who, like their ancestors, still wish to wear earrings. 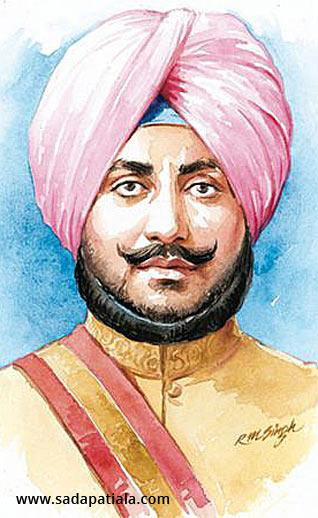 While the colours of the Patiala turban were always light, pink and lemon were regarded as the state colours. ��The colours have to be soft", says Raja Malvinder Singh, scion of the Patiala royal house. He says light colours were worn since the Patiala turban took its final shape during the reign of Maharaja Bhupinder Singh. He recollects that different colours were used, depending on the festivals being celebrated. For example, the tarbuzi (watermelon) colour was worn during the Dussehra season. The darkest hue thus worn was dhani (dark green) to mark the Muslim mourning at Moharram. Raja Malvinder states that though a style which could be loosely described as a Patiala one first came into being during Maharaja Rajinder Singh's time, it did not become identified as such and standardized until Bhupinder Singh's reign. The Raja says that whereas the best quality of mal-mal cloth from Dhaka was used at first, Finlay's made it more accessible and commonplace once it started manufacturing the F-74 label. However, the width of this new version was 20 inches less than the earlier supply, as a result of which the turban became slightly smaller. He adds that presently only families associated with the Patiala State have continued sporting the style. "I used to wear the Patiala Shahi turban when in college, but my style changed when I joined the Army," says Mr. Randhawa. The same is said to be true of royal family scion, Capt. Amarinder Singh. Presently, very few neelgars (dyers) in the city are said to be able to get the Patiala colours right. The traditional artisans were from the Punjabi-Muslim community, but the art is gradually being lost because few of their descendants still ply the trade in the region.